Everyone connected with hockey is guilty of blunders! General Managers are! Ask John Ferguson Jr. about whom he got in exchange for Tukka Rask, the Bruin’s star netminder. He will likely mumble something about Andrew Raycroft, who had a so-so season with Boston previous to that swap. Coaches are! If in doubt, ask Don Cherry about the 1979 playoff game when his Bruins were penalized for too many men on the ice. The horrendous result, which robbed his troops from advancing to the Stanley Cup finals, was that the Canadiens scored to tie the match, then won it in overtime. Bye Bye B’s! Goaltenders are! Ask Colorado backstop, Patrick Roy, about his gaff in game seven of the 2002 post-season against Detroit. Stopping a shot, he raised his gloved hand in triumph, only to realize he was not holding the puck, and see Brendan Shanahan push it in the net for a goal. Defensemen are! Just ask Steve Smith about his unforgettable goof in the 1986 play-downs. In the series between his Oilers and the Calgary Flames, the normally steady rearguard was too casual in attempting to pass to a teammate. The puck hit goalie Grant Fuhr in the back of the leg and caromed into the cage. The fate of the entire series rested upon that error. Forwards surely are! Ask Patrik Stefan about the time he corralled a loose puck in open ice, with nothing but free sailing facing him; and as he got to the open net, he missed the yawning cage and fell down. It’s a classic! So it should not be surprising that those who are involved in that general aggregation called the media, also are guilty of slips of the “pen” or the tongue. Communication is their business—and it is incumbent upon them to be as accurate as possible in that responsibility. But tain’t necessarily so! Miscommunication can cause real problems. History records one of those defining moments. On June 18, 1815, a man stood in the tower of the Winchester Cathedral anxiously gazing out to sea. He was looking for the ship which was to send signals by use of lights concerning the outcome of the Battle of Waterloo—news of the conflict between the Duke of Wellington and Napoleon Bonaparte. Finally he spied the blinking lights. But the message barely commenced when fog began rolling in. He read, “Wellington defeated……” With a heavy heart he relayed the news to other stations. All England was overcome with gloom and sadness. And a typo, an unconfirmed rumour, or a poorly researched conclusion can give the wrong impression, the wrong idea, or the wrong information about any significant topic. Though hardly as crucial as the unfinished message in 1815, its single impact, or the jump start in a domino effect, can be seriously misleading. For instance, Charles L. Coleman’s three-volume set, “The Trail of the Stanley Cup” is a masterpiece of journalism. 2698 pages of hockey history, touching on the profile of every team, in every league, involved in competition for the most famous team award the game has known. Commencing with the 1892-93 campaign of the Amateur Hockey Association of Canada, it unfolds the schedules, scores, statistics, and significant highlights of that season, and follows that pattern through until the NHL’s expansion to 12 teams in 1967. Yet, on page 162 of volume one, four pages after referring to the Queen City’s entry as simply “the Toronto club”, he tagged them as “The Toronto Maple Leafs” as “champions of the Ontario Professional Hockey League”. Hardly a hanging offense. But this writer, a novice in the game’s history at that time, recalls reading that for the first time and remarking, “I didn’t know there was a Toronto team called the Maple Leafs back then!” There wasn’t! Not until late in the 1926-27 season was the nickname “Maple Leafs” given to a Toronto sextet. “What? You castigate an author for one error in 2698 pages! ?” Hardly. Coleman admitted after his mammoth project that he had made others. It simply indicates how wrong information can change the context. This is by no means an ambush on the media connected with the world’s fastest sport. The vast majority of times they do “get it right.” When they don’t, several missteps are actually amusing—not hilarious—but of the belly laugh kind. Others prompt the rolling of the eyes. Still others are a commentary on how easy it is to drop the ball. But they are all goofs! The story has been told and retold about Alfie Moore’s heroic effort as a substitute goalie for the Blackhawks in the 1938 playoffs against Toronto. Chicago’s regular twine-tender, Mike Karakas, was unable to play because of a broken toe. His understudy, Paul Goodman, could not be brought in to fill the gap in time. So, knowing Moore lived in the city, a call went for him to fill the gap. According to twice-told tale, he was discovered in a tavern, already having had a dozen drinks with some other players who were through for the season. He was conscripted and dragged to Maple Leafs Gardens, where coffee and a cold shower were used to sober him up for action. He played over his head and led the Windy City contingent to a 3-1 victory. Bob Elson was the radio play-by-play announcer for the Blackhawks in the early 1940’s. He was known for his relaxed attitude when calling the action for the Windy City crew. Apparently, he was fun-loving and a bit of a wit as well. Two examples of what are believed to be “accidentally on purpose” flubs took place in 1941. The first “slip” was recorded during the February 22 game between the Hawks and the Habs. He described “Dahlstrom and Chamberlain bumping together and both fell to their feet!” The second boo boo seems to have been connected with the December 9th contest again Boston. This time he got his mords wixed and referred to the Chicago-ites as the “Blockheads”! Modere “Mud” Bruneteau quietly, but efficiently, plied his trade on the longest-lasting forward line in the NHL during wartime, along with Sid Abel and Carl Liscombe. In fact, he continually set the pace in the stats department. Yet, after nine years in the world’s premier circuit, the league hadn’t fine-tuned his profile in their records. He was still incorrectly profiled as left-handed shot playing left wing—when after some 320 games he was, as he had always been, a right-handed shot cruising the right corridors on the ice of the various arenas. 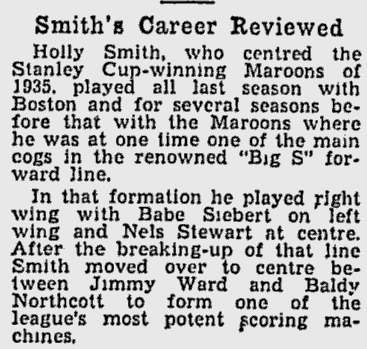 During World War II, every NHL team was scrambling to find enough talented skaters to ice a full roster. Fresh out of junior hockey, Harvey Bennett Sr. was called upon by the Boston Bruins to share goalkeeping duties with Paul Bibeault for the 1944-45 campaign. He was between the pipes for the Beantowners for 25 games. One publication recorded that he subbed for Chuck Rayner who was in military service. ”Bonnie Prince Charlie” was indeed wearing an armed services uniform—but he had exchanged a White, Gold and Black for Navy Blue. He had last stood in the crease for the Brooklyn Americans. It was Frank Brimsek, who had enlisted from the Hub scene, whom Bennett had replaced. The scoop was this: Jon Washington knew about the approaching nuptials, and, in preparing a piece for a magazine, he reported it as a done deal. But the fact of the matter was the couple decided it wasn’t the right time, and put the wedding on hold. Eventually the ceremony did take place, but sometime after the announcement in print. Every scribe who reports on NHL hockey in the city in which he is part of the sports writing team, is not always known for his savvy about the ice game. That is especially true where expansion teams are involved. So, even though the Blues had been in St. Louis three seasons, this miscue made it into one of the locale’s newspapers. When Montreal’s injury list was published, Larry Pleau, suffering from torn knee ligaments was referred to as Larry Ceilarsville. Tokyo Kanatas (Swords). When he saw the confusion on the part of other GM’s he continued the gag, by listing him on the training camp roster. But worse, the team Publicist included him the Sabres’ Media Guide—and other teams followed suit. Still with Media Guides, the Toronto Maple Leafs 1980-81 included the page for Bill Derlago. He was a stocky fellow, whose legs were unusually sturdy. But he was listed as weighing 914 pounds! Back in March 1988, ESPN’s Roy Firestone, while interviewing Ron Hextall, managed to pull a couple of boners in the process. First he acknowledged that “goaltenders can be unusual”, and proceeded to give a “for instance”. 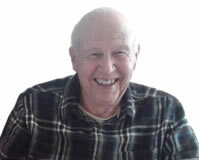 He noted how Gilles Meloche believed that he had lived another life centuries ago. However, while he had a right situation, he credited the wrong twinetender—it was actually Gilles Gratton. He then broached the subject of Hextall’s problem of clearing the puck from his own end—accusing the only backstop who actually scored two goals in his career. Oooops! It always takes the sports segment of the fifth estate in a new city time to get used to every element of the game—including the name of team members. When the Panthers had been just a year in Florida, a Miami broadcaster was discussing former Winnipeg Jets’ Doug Smail and Dale Hawerchuk. He inadvertently referred to them as “Smell and Hawercheck”! Hockey fans will remember the Mighty Ducks’ gas-powered wall of fire. Players entered the playing surface before the game through this glaring hoop. As well, the player’s names were featured in lights. Misspelled skater’s names is nothing new—we have already made reference to one instance above. Over the years coach Rudy Pilous was Lou Pilsoux; Eric Staal’s surname was Stall; Lars Eller grew old quickly with Elder; and even “the Great One” was not immune, with “Gretsky”. But when it is magnified in living colour it is even worse: Paul Kariya was Paul Karpov! The truth of the matter was that he had sustained a back injury in collision with Janne Laukkanen of the Ottawa Senators and was unable to play. Apparently this was not the first instance of what the team called “reckless sensationalism” by the local station. NHL team Media Guides have often been guilty of blunders, as has already been noted above. And some later Fact Books are not always an improvement on the earlier ones. For instance, the Maple Leafs were guilty in 1998-99 of giving Tomas Kaberle the persona-non-grata treatment. Even though he began his career as a member of the Blue and White, he was not listed as part of the players roster. In fact, he was not even included in the “Players in the System” section. In the 2000-01 version of the Rangers’ publication, Valeri Kamenesky was also left out of the “Active Player Roster”. Instead he was listed among the “retirees”. In 2009, when the St. Louis Blues included the all-time Captains line-up, Jimmy Roberts’ name, who had worn the “C” during the 1971-72 campaign was nowhere to be found. It’s amazing what just one wrong vowel can do to change the sense of a statement. Following the May 11, 2006 match between the Senators and Sabres, the Ottawa Citizen printed a comprehensive summary of the contest. It included little tidbits like “Zdeno Chara led all players in total ice time—30 minutes and 50 seconds; Christoph Schubert and Daniel Alfredsson had the most shots by individual Ottawa players—four each; Alex Kaleta was the leader among the Buffalo sextet with five; and Jason Spezza won 11 of 15 faceoffs; and the Sabres outsh-t the Senators 32-28! Buzzfeed, the multimedia giant, got its wires crossed in 2014—it referred to the Los Angeles Kings being based in Sacramento. Actually the basketball team in that city is also the Kings. The old adage spawned from Mark Twain’s response to his mistaken obituary—“Reports of my death have been greatly exaggerated”, in principle, would seem to apply to Edmonton’s scoring sensation, Connor McDavid. In 2015, his first season in the NHL, a video displayed several spectators in Oiler gear weeping openly. The reason portrayed was that he had suffered a “career-ending” injury during his first ever shift on the ice. On May 8, 2017, after the Predators had eliminated the St. Louis Blues, one Nashville newspaper reported that the locals’ latest playoff win meant they were going directly into the Stanley Cup finals. Actually they had to complete the challenges of the Conference Finals first. And then there was the time the Montreal Wanderers were referred to as the Wonderers. George Bernard Shaw was right: “The single-biggest problem in communication is the illusion that it has taken place.” I rest my case!